It was almost a year ago, at Apple's WWDC 2017 event, when we first heard official word about the Apple HomePod. Basically, a smart speaker, much like the Amazon Echo and Google Home. After some silence, however, it turned out the HomePod was intentionally delayed since Apple believed it's “not ready yet”. Well, the wait is over: the Apple HomePod will officially start shipping on the 9th of February, while pre-orders open this Friday, the 26th of January. It's a 7-inch-tall cylinder covered with a stylish-looking, seamless mesh fabric. On the top, we have a small display to show us when Siri is listening, and touch controls to interact with HomePod without talking. A single woofer and seven tweeters deliver fine-tuned, balanced sound for every situation. We'll get to that in a bit. 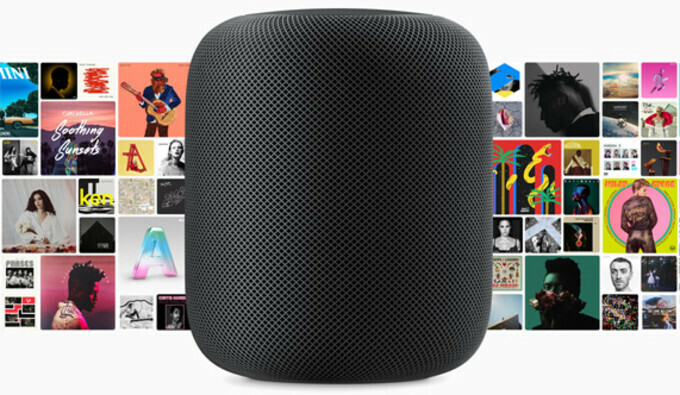 The HomePod is a smart device and, as such, is powered by the Apple A8 chip. In other words — the same processor that hummed under the hoods of the iPhone 6 and iPhone 6 Plus. The Apple HomePod is meant to be a home entertainment system with a twist. Its marketed as a multimedia device fist and foremost, probably because Apple can't hope that Siri would beat the Google Assistant on the Google home. Its primary function is syncing with your Apple Music library and delivering your favorite music as soon as you say “Hey, Siri”. It can also very easily pair with your iPhone — just hold up your handset next to a fresh HomePod and the pairing is done, much like the AirPods' super-quick process. Once paired with your handset and iCloud, the HomePod can send texts, set reminders, check the latest headlines, play your podcasts, and make phone calls through your paired iPhone. If you have HomeKit accessories throughout your house, HomePod will also be able to control those — lights, air conditioning, and so on. You can also enter macro commands to do multiple things at a time — for example, saying “Hey Siri, I'm home” can turn on the lights and dial the thermostat higher. Another great news is that you won't be tied to iMessage. SiriKit for HomePod is an SDK, which will be made available to 3rd party developers. So, if you'd be able to say “Text Jeff over WhatsApp”, if your friend doesn't happen to use iMessage. The only thing that's left is for developers to pick it up and implement it with their own messengers. 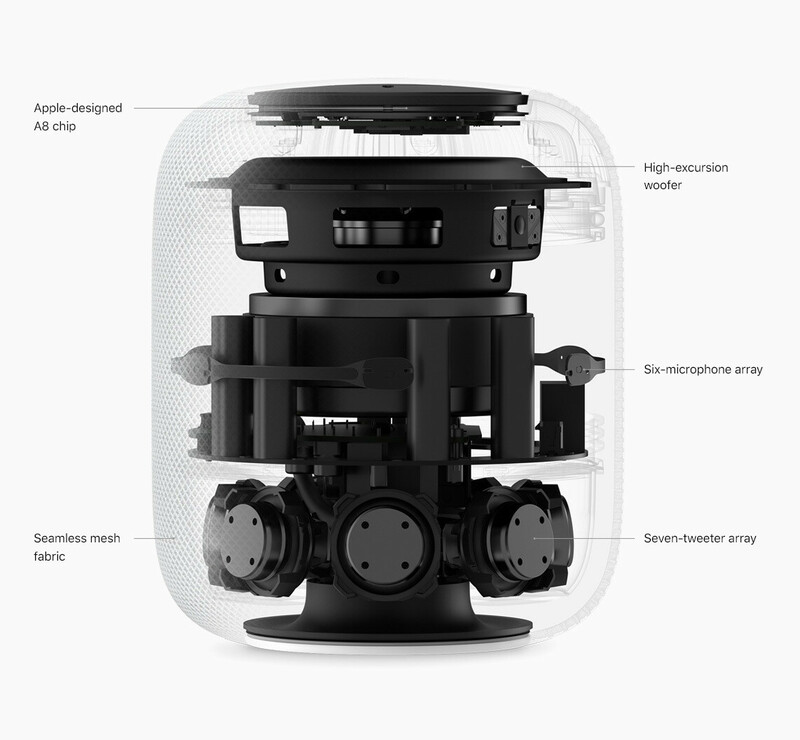 As we said, the HomePod sports a custom-made woofer and 7 “beam-forming” tweeters, which are nested in a circle around the pod's. The device is spatially-aware, meaning it will be able to detect surfaces next to it and fine-tune the volume response of all speakers in order to “fill up” the room as best as it can. You may recall that the Google Home Max touted a similar feature, but it only has 4 speakers — 2 woofers and 2 tweeters — which are pointed in the same direction. If you happen to have too much money on your hands, you can grab a couple of HomePods and spread them throughout the house. With multi-room audio support, you can ask Siri to either play different songs in the different rooms or play the same tune across your house, in sync so it doesn't feel weird when the speakers overlap. Putting two HomePods in the same room together will allow you to activate stereo mode for a louder, more spacious oomph. 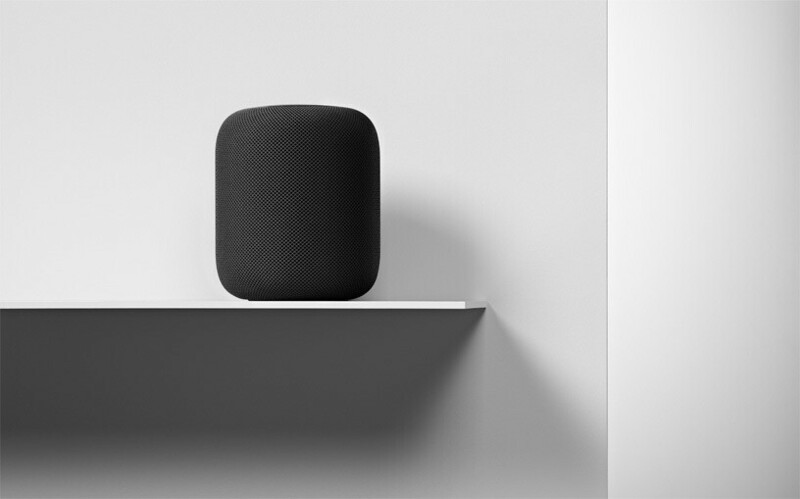 The HomePod will be shipping on February 9th, with pre-orders kicking off this Friday, the 26th of January. It'll be available in Space Gray and White, priced at $349. That's $50 less than the retail price of Google's Home Max! This seems less like information and more like an advertisement. 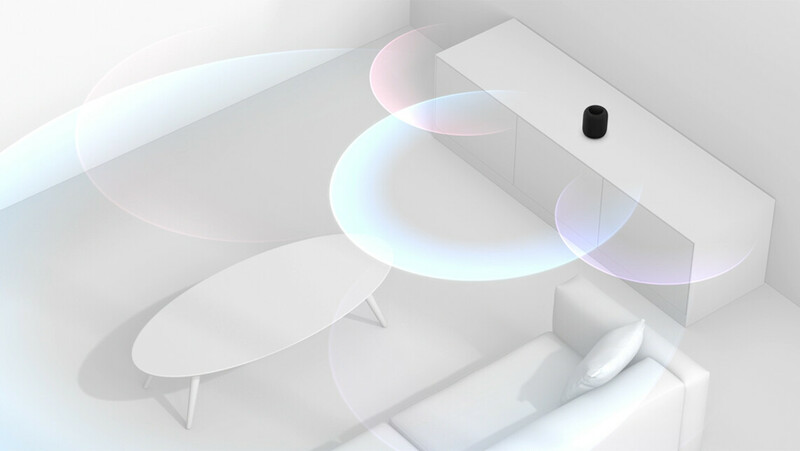 The not-so-subtle taunts at home max and over-glorification of homepod seems too fanboyish. I'm not saying that the homepod is bad or anything, just that the article is. You're right - it does read like an advert. I'm sure the review of the speaker will sound like an advert as well. There is Google Home which is cheaper again, and Google home mini which is an even cheaper version. The real reason people buy these smart speakers is for the smarts, and when the less expensive versions dropped onto the market. That is when 10's of millions of them sold. It certainly isn't because of great sound or audio quality. Besides you can buy a bose speaker from Apple no less for under $200, then buy a cheaper Echo or Mini and play things that way. Or better yet if you have a TV or home theater system, then you can still buy an inexpensive mini or echo and play music through your TV or theater system and still save money. They even have the advantage of playing YouTube videos, movies, music, Netflix and more using a mini or echo. Plus you will get the great sound and play more stuff than Apples Siri speaker. We still don't know the capabilities of Siri, because if she has stayed the same. Then I am sorry, but she is a dumb speaker then. is it going to "find this on the web for me" and have me read it myself every time I ask it a question? Multi room support and the ability to use two to create stereo music is not available at launch, will come in an update later this year lol. This is a beta product. One thing I notice that differs with Google Home is that it will need your phone to be able to text and make phone calls, while Google Home can make phone calls without being tied to your phone (OTOH it can't send texts yet though). Also will it HomePod be able to have multi-user support if the other users don't have an iPhone to pair it with? Google home can play music, movies, YouTube videos, Netflix, and more to your TV or home theater system. Even the mini can do that as well. It doesn't look like Apples Homepod can do that. Yeah that;s the other thing I wonder about as well. With Google Home, it's easy to cast videos to a Chromecast or Android TV device, but will the HomePod do it to an AppleTV (obviously I doubt Apple will be casting videos to Chromecast, Android TV, Fire TV or Roku devices). “the same processor that hummed under the hoods of the iPhone 6 and iPhone 6s.” 6 and 6 Plus not 6S PA.
Wow "priced BETTER than the Google Home Max!" Well it would have killed someone to say priced cheaper or less than the Google Home Max? Way too expensive and a little too late to the party. Isn't WWDC held in the Summer? Last I checked that is not "almost a year ago". Little dramatic there. I could be wrong though.